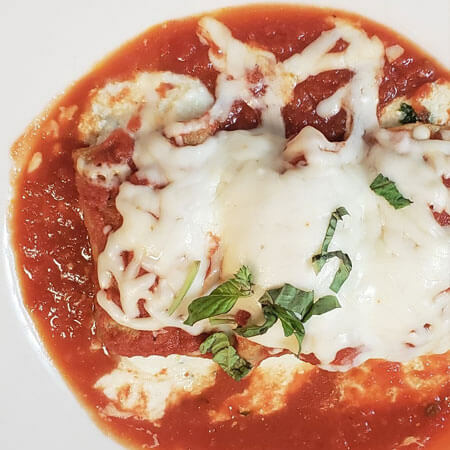 Baked eggplant, stuffed with ricotta cheese, mozzarella and topped with fresh tomato sauce. Breaded mozzarella pan-fried in olive oil garnished with marinara sauce. Grilled zucchini,‏ eggplant, yellow squash, tomatoes, and mushrooms in olive oil over a bed of organic mixed spring greens. Homemade mozzarella, prosciutto, salami, olives and roasted peppers. Fresh shrimp sauteed in a white wine garlic sauce. Fresh diced tomatoes mixed with chopped red onions and fresh basil served with a side of toasted garlic bread. Pan tossed with caramelized onions, garlic, and Italian seasonings. Famous in our hometown. Fried or Baked. Tomato sauce, fresh mozzarella, ham and basil.